FUJIFILM North America Corporation, Graphic Systems Division announces the recent install of the Inca Onset X2, at Innomark, a Miamisburg, Ohio-based visual communications provider for retail signage, displays, and packaging; offering in-house design, printing, manufacturing and fulfillment capabilities. With a maximum throughput of 6,889 ft²/hour, equating to 128 beds per hour (126.8” x 63”) the Onset X2 is ideal for companies such as Innomark producing fast-turnaround retail graphics. As Innomark’s business expands, they can add ink channels to increase capacity and extend the range of jobs that can be produced efficiently. The addition of a third set of CMYK will deliver even higher productivity. A choice of unidirectional, bi-directional and super high-quality print modes can be selected depending on the specific job requirements. The Innomark team did a lot of research prior to installing the Onset X2, and with a client list of well-known national retailers within industries including sporting goods, pet care, cellular, beverages, and women’s apparel with very stringent quality expectations. Pictured right is Steve Zick. Innovative Tier Drop technology delivered by Fujifilm Dimatix drop-on-demand printheads enables the Onset X series of presses to jet 11 – 14 – 17 picoliter droplet sizes to meet changing speed and quality needs. 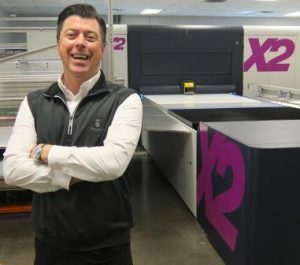 With the Onset X2 in their line-up running three shifts per day, Innomark is now able to say yes to more jobs for existing clients, as well as for many new business opportunities. And with a choice of automation systems, including three-quarter or fully automated system, Innomark can increase throughput by reducing manual change-out of materials. To learn more about Innomark, please visit: www.innomarkcom.com.